Decorations in the snow is another lovely example of simplistic holiday ecards for business designs that creates a charming and unique design that would fit almost any holiday ecards purpose. 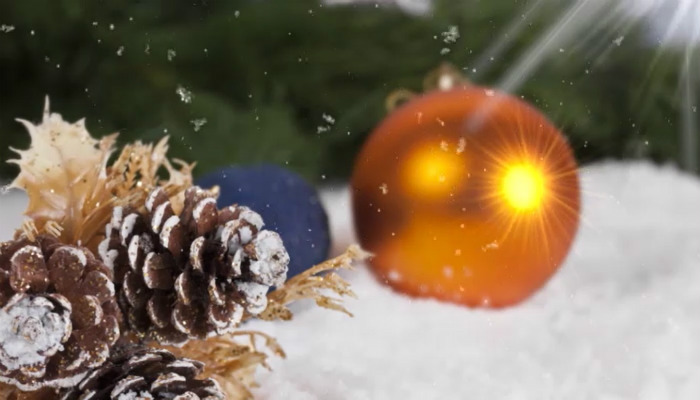 The use of clashing colours like the dark brown of the pine cones and the almost neon orange colour of the lone Christmas bauble give this holiday ecard a childlike innocence and charm. The shiny almost neon orange colour is a less seen colour of bauble and makes a nice change from more traditional bauble colours like red or blue. The placement of the pine cones in the foreground is a nice change of pace from other more often seen Christmas trinkets like bells or ribbons for example and the soft powdery snow that is sprinkled over them helps create a softer and more festive image. The lone shiny orange bauble serves as a brilliant contrasting item to the pine cones and helps add a dash of extra colour in the background to this lovely festive holiday seasonal design. Why not add a personal message for a friend or relative or maybe your own business logo and details and see for yourself how lovely this more unusual e Christmas cards for business template will look.